Casted in Hensley & Gibbs moulds. These bullets are design for you to create your own combustible envelope cartridges. You can also use them as they come with black powder. 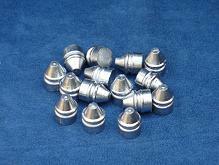 Very soft alloy, with a brighter aspect than pure lead bullets (96% lead / 4% tin).